Intro- So, this is my first book review, and any comments or feedback would be much appreciated. I have always had a deep appreciation for GLBTQ (for the out-of-the-know, that's Gay, Lesbian, Bisexual, Transgendered and/or questioning) books and cinema. I believe there really can't be enough of this resource for the GLBTQ community, especially youths who aren't yet sure where or how they fit in. I hope that Christians and gays can unite someday and throw away the silly prejudices one has about the other. It's only then that we can make our way towards a better GLBTQ future. 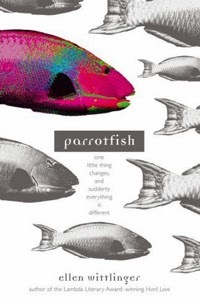 The book- "Parrotfish" is a funny and tender light read that nonetheless has content that will provide serious discussion. It asks the question, between the lines of straight and gay, male and female, how does what the youth hem or herself wants fit in? Why is gender such a big deal? Grady Katz-McNair is by all accounts a very ordinary boy, except he's not. You see, Grady is Angela, a biological female, and vice versa. Angela/Grady is a smart, funny, and razor-sharp transgendered teenager. 'His' family is shocked when he comes out as Trans, and why shouldn't they be? It's a big change. But Grady doesn't think so. This is who he's always been, only now he has gone the whole nine yards- cutting his hair, binding his breasts, and swapping 'Angela' for a more masculine name. Grady requests acceptance- and reactions at home and school run the gamut, from horrified and horrifying to accepting to somewhere in between. Grady finds unlikely allies in Sebastian Shipley, the High School geek, and Kita, a fierce beauty and Grady's first love interest, while growing further and further away from his old friend Eve, who has starting hanging out with some very nasty girls. An interesting technique that is used in this book is the ironic, imagined conversations Grady comes up with. In these talks, people say what they really think, and everything is out in the open. Many writers would write over-the-top, unbelievable dialogue just to be funny, but author Ellen Wittlinger finds away around this and also, in doing so, adds humor and credibility to Grady's character. I wasn't sure about some of the side characters. Sebastian seemed like a little too much of a super-nerd who always runs to Grady's defense, is blisteringly intelligent, and doesn't care what anybody thinks. Kita was a little aggressive. A good example of her aggression is when she goes ballistic because there was a drag comedy routine at high school and believes that Grady's rights are being infringed upon. I mean, burlesque acts involving cross-dressers have been going on for years, and so what? They're just for fun. My dad did a Miss Emergency Pageant in full drag, but not to be offensive to transsexuals. You can do it in a way that is offensive and homophobic. But that's not the only option. So, I think Kita overreacted. And she and Sebastian are somewhat one-dimensional. But they don't ruin a very entertaining book. "Parrotfish" is a LIGHT read, emphasis on light, so don't expect literary gold. But you can still learn from it. Grady is a hilarious and lovable character. He's extremely intelligent and sarcastic, which just makes him more lovable. But he just wants to be himself yet still receive his family's approval. I also loved the character of Miss Unger. She doesn't turn out to be how I first thought she would at all. This book is thematically similar to "Luna" by Julie Anne Peters, and has a blurb by Peters on the back. "Luna" is a little more literary, but I like them both in their own way. "Parrotfish" is a lot of fun yet sensitive to its subject matter. I also think it would make a great movie if the they cast it right. None of the A-list young Hollywood starlets would pass as a boy like Grady does, so I think they'd have to cast an unknown, and also pick someone who actually looks about sixteen (okay, I think I have a pet peeve with alternately hulking and buxom thirty-year-old actors playing fifteen- and sixteen-year-olds.) I'd recommend this book to the open-minded and those who remember being a teenager. Interesting read Sarah. I appreciate your recommendation. I hope that those who do read it increase their love and empathy for the LGBTQ community. Well done, Sarah. I might have to check this one out. The imagined conversations aspect sounds intriguing, if handled as well as you mentioned .